The increasing focus of fitness conscious consumers on changing lifestyles to live healthy has created a significant demand for hygienic and aseptic valves. These valves are predominantly being used for eliminating preservatives that are used on making several food items and beverages. The growing awareness about the negative impact preservatives is expected encourage the uptake of these valves in the food and beverages industry. According to the research report, the global hygienic and aseptic valve market was worth US$6.0 bn in 2015 and is expected to reach US$9.0 bn by the end of 2025. During the forecast period of 2016 and 2025, the market is expected to witness an expansion at a CAGR of 4.8%. The global hygienic and aseptic valves market’s growth will also be supported by the increasing emphasis on sanitary regulations established by the food and beverage industry. The growing awareness amongst manufacturers to ensure food safety practices is also projected to boost the demand for these valves. The rising compliance of small-and medium-sized businesses towards these food safety regulations has also augmented the demand for hygienic and aseptic valves. Efforts to automate and modernize manufacturing plants to meet the ever-increasing needs of consumers has bolstered the uptake of hygienic and aseptic valves across the world. On the basis of application, the global hygienic and aseptic valve market is segmented into dairy processing, food processing, beverage, pharmaceuticals, and biotechnology. Out of these applications, the beverage application segment held a lion’s share in the global market in 2015. In terms of revenue, the market held a share of 32%. Analysts anticipate that the pharmaceuticals application segment is poised to witness a remarkable growth rate in the coming years as several nations grapple to satisfy the medical needs of patients. Owing to this reason, the pharmaceutical application segment will show a sustained demand for hygienic and aseptic valves for the purpose of sanitation that is required in drug manufacturing processes. In terms of geography, the global market is segmented into North America, Asia Pacific, Europe, the Middle East and Africa, and South America. Analysts project that Asia Pacific will be the dominant user of hygienic and aseptic valves throughout the forecast period. In 2015, the region held a whopping share of 40% in the overall market, which was followed by Europe and the U.S., which held 26% and 22% of the global market revenue respectively. The demand for hygienic and aseptic valve in Asia Pacific will be driven by the booming manufacturing activities that are focused on achieving operational excellence and energy efficiency. Some of the leading players operating in the global hygienic and aseptic valves market are ITT Corporation, SPX Flow, Inc., Cipriani Harrison Valves Corporation, Pentair Plc, GEA Group AG, Alfa Laval AB, Evoguard GmbH, M&S Armaturen GmbH, Zhejiang Yuanan Liquid Equipment Co., Ltd., Nocado GmbH, Kieselmann Fluid Process Group, INOXPA S.A., Definox SAS, Burkert Fluid Control Systems, Bardiani Valvole SpA, Gebr. Rieger GmbH & Co. KG, GEMU Gebr. Muller Apparatebau GmbH & Co. KG, and Armaturenwerk Hotensleben GmbH. 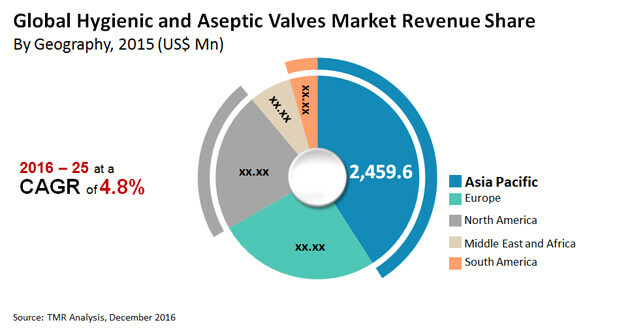 The competitive landscape of the global hygienic and aseptic valve market is fragmented due the presence of several players in the market. These players are expected to focus on strengthening their presence in emerging economies as a means to ensure sustainable returns in the near future. The “Hygienic and Aseptic Valves Market” report provides analysis of the Hygienic and Aseptic Valves market for the period 2015–2025, wherein the years from 2016 to 2025 is the forecast period and 2015 is considered as the base year. The report precisely covers all the major trends and technologies playing a major role in the hygienic and aseptic valves market growth over the forecast period. It also highlights the drivers, restraints, and opportunities expected to influence the market growth during this period. The study provides a holistic perspective on the market’s growth in terms of revenue (in US$ Mn) and shipment (thousand units), across different geographical regions namely North America, Europe, Asia Pacific, Middle East & Africa and South America. The market overview section of the report showcases the market dynamics and trends such as the drivers, restraints, and opportunities that influence the current nature and future status of this market. The report also provides the competitive landscape for the hygienic and aseptic valves market, thereby listing out all the major players according to their geographic presence, market attractiveness and recent key developments. The competitive landscape section of the report also gives an overview about the most targeted regions/countries by these key players in order to strengthen their market position in future. The hygienic and aseptic valves market data estimates are the result of our in-depth secondary research, primary interviews and in-house expert panel reviews. These market estimates have been analyzed by taking into account the impact of different political, social, economic, technological, and legal factors along with the current market dynamics affecting the market growth. Moreover, key recommendations has been provided at the end of competitive landscape section which will help the operating companies to make the best move in this market. Based on different valve types, the report segments the hygienic and aseptic valves market into hygienic single seat valves, hygienic double seat valves (mixproof valves), hygienic butterfly valves, hygienic control valves, and aseptic valves. On the basis of several hygienic valve applications, the market has been segmented into dairy processing, food processing, beverage, pharmaceuticals, and biotechnology. In order to give more clear idea about the market revenue, cross segmentation analysis of all the valve type (under scope) has been provided for every application segment. In terms of geography, the global hygienic and aseptic valve market is classified into North America, Europe, Middle East & Africa, and South America. In terms of growth rate, Asia Pacific is expected to portray maximum CAGR (%) during the forecast period. This is majorly driven by heavy export of industrial valves and high level of manufacturing activities in the region. Strong growth in manufacturing activity in Asia Pacific region can be seen as the result of rising standards of living due to improving consumer income, which is encouraging increased spending on chemicals, fuels, and food & beverage. Asia Pacific is projected to maintain its leading position during the forecast period from 2016 to 2025. ITT Corporation, SPX Flow, Inc., Pentair Plc, GEA Group AG, Alfa Laval AB, Evoguard GmbH, M&S Armaturen GmbH, Nocado GmbH, Zhejiang Yuanan Liquid Equipment Co. Ltd., Keiselmann Fluid Process Group, INOXPA S.A., Definox SAS, Burkert Fluid Control Systems, Cipriani Harrison Valves Corporation, Bardiani Valvole SpA, Gebr. Reiger GmbH & Co. KG, GEMU Gebr. Muller Apparatebau GmbH & Co. KG, and Armaturenwerk Hotensleben GmbH, are the few key players which have been profiled in this study. Details such as financials, business strategies, SWOT analysis, recent developments, and other such strategic information pertaining to these players has been duly provided as part of company profiling.